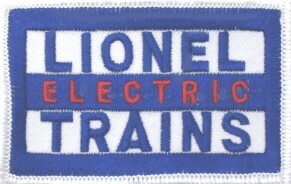 This Lionel Electric Trains Patch is a high quality Lionel Electric Trains logo embroidered sew-on patch and can be used on hats and vests. Your railroad patch collection would not be complete without the addition of this beautiful Lionel Electric Trains patch! Our patches are easily sewn on, and high quality for years of use. Rail Photos Unlimited has been supplying the railroad enthusiast community with quality railroad patches and railroad hat pins for over 30 years. Over 360 available to choose from. Size: 2" x 3". This product was added to our catalog on Thursday 05 November, 2009.